My friend Lacy asked if I'd pass on some info on a fundraiser she's working on. It's for a dance scholarship in the name of Donna, the little girl who passed away in October. "Good Art for Good Things is a night of fun and somewhat raucous theater to celebrate a serious cause. All proceeds from this event will go to the Donna's Good Things Fund in honor of Donna Quirke Hornik (2005-2009). "Donna's Good Things is an agency for good works, good deeds, GOOD THINGS in Donna's name: dance scholarships. Portable DVD players for kids going through treatment on long hospital stays. Essentially continuing Donna's special gift of spreading joy and light. "Tickets are on a sliding scale: $15 - $25. "Sunday, Dec. 6 at 8pm. Trap Door Theatre. "Space is limited: RESERVATIONS ARE STRONGLY ENCOURAGED! 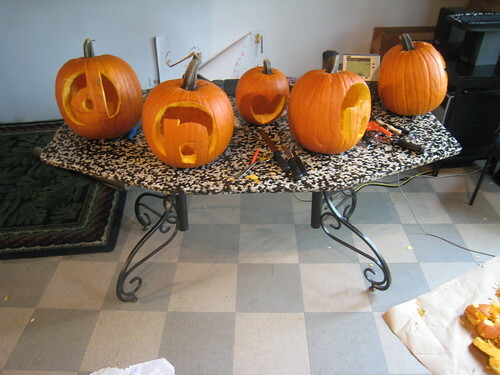 Send yours in to GoodArtGoodThings@gmail.com!" Not sure exactly what the entertainment pieces will be, but I know several of the performers and expect good things. I do know that Lacy will be performing her adaptation of Beowulf using Barbie dolls. I'm going. Maybe I'll see you there. I'll try to get and post some info soon on how you can make a donation if you can't attend in case anyone's interested. 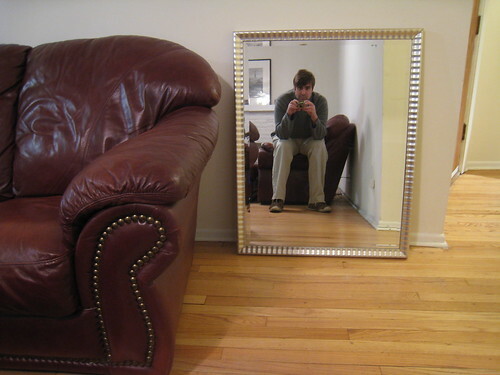 Still not sure what to do with this mirror. It looks kind of good right there, right? Bob and Stacey are in town from Portland where they moved a few years back to open their own comedy theater. 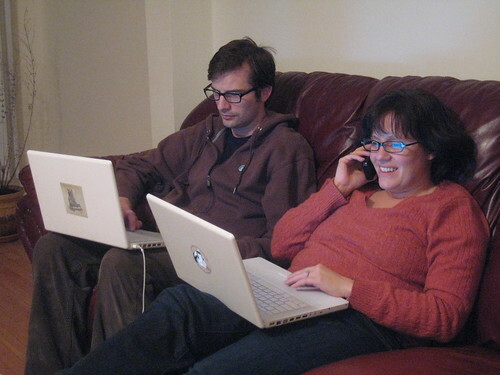 Even though it’s their vacation, there are a lot of calls to be taken, emails to be answered. Theater business. Stacey: This is the first time we’ve gone away for so long since the theater opened. Bob: It’s a lot like having a baby. Me: It’s a lot like having a baby that has a job. I wrote back in March when we first moved in that, "the view from our back deck has a lot of 'Rear Window' potential." 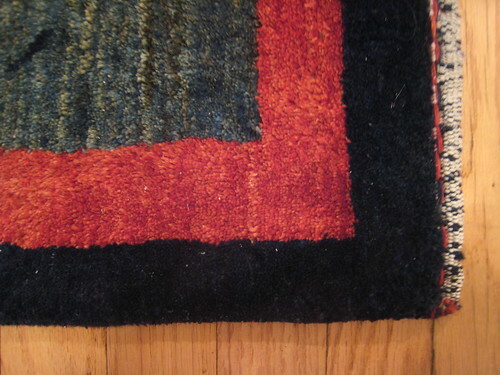 While out in the suburbs for Thanksgiving we picked up some rugs that Sarah's grandmother kindly gave us. Lugging a large rolled up rug up the backstairs in the middle of the night, I wondered if I was giving someone else a 'Rear Window' moment, spotting me, a kind of reverse Raymond Burr, dragging a body into my home under cover of night. Out to the suburbs for Thanksgiving with Sarah's family. Things started winding down around 8. People packing up their kids and heading home. Sarah's Uncle: Remember when we used to stay up late on Thanksgiving? This family gets lamer every year. We need to rely on the young people here to keep the party going. Sarah: Oh wait, are WE the young people? Sarah's Uncle: Yes. You two. 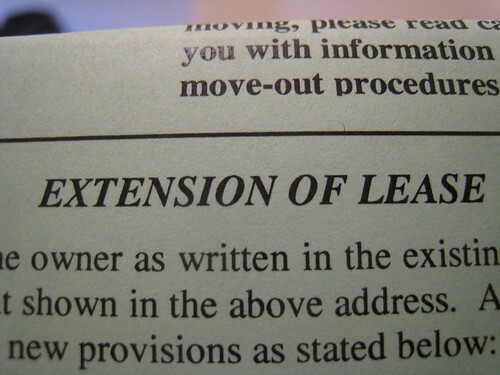 Our lease isn't up until March, but we've already begun getting long official documents asking whether we'll renew or not. I lived with a different girlfriend once, years ago, and after that came to an end, I kept a blog about getting over it. I wrote, "I've been thinking about leases and love. I wonder how many relationships end because the lease is up? I mean literally. For N and I it came down to, the lease is up at the end of June, do we sign up for another year together? The answer was no. I don't think either of us were one hundred percent certain that we wouldn't have been able to make another year work, but the chances were slim. And if we were going to lose each other, we didn't want to lose our security deposit too." It's nice to feel differently this time. Things haven't always been perfect, Sarah and I even came close to breaking up several months back (cut to lots of blog posts about dying plants), but things have also been good, and we're both ready to sign on for another year. But will we be here? We like the apartment. The neighborhood could be better. So, we're keeping the relationship, but whether we're keeping the apartment is up in the air. 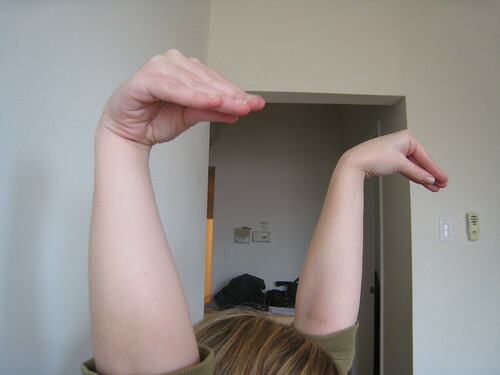 Hanging out on the couch, watching TV, Sarah suddently shot her arms up over her head, forming her hands into beaks, and yelled, "These cranes are happy!" We laughed about this for a while. Me: We're the stupidest people I know. Me: It's a good thing we're together, because no one else would find that amusing. Seriously. Imagine someone else was sitting next to you right now. That would have been real awkward. 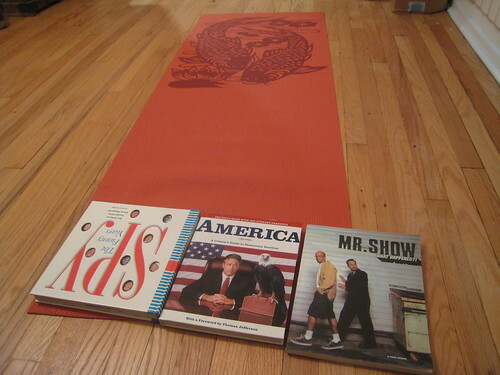 Sarah's flattening out her yoga mat, and for some reason it's funny to me that these are the books she used. Satire isn't the opposite of yoga, not exactly the yang to yoga's yin, but still, there's something there. 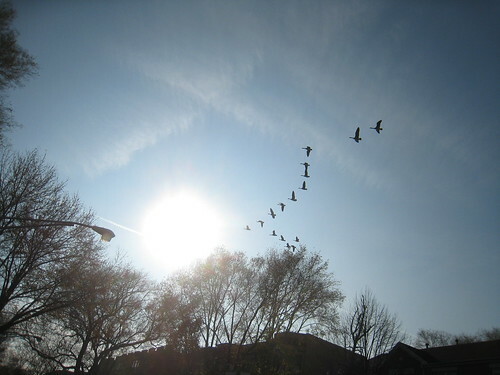 A surprisingly beautiful November Chicago day. Still, it's hard not to be jealous of those smart enough to get out of town for the winter. The terrible children next door have mostly disappeared as it's turned cold, but are back out in full force on this unseasonably nice afternoon. 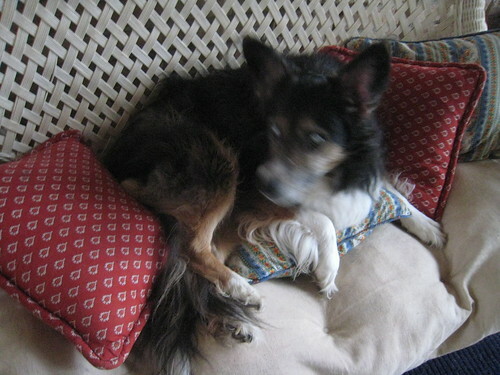 By popular request, a picture of Tetley, the totally blind dog. Interestingly enough, there have been no requests for pictures of the newborn. You can check Facebook via your XBox now. I certainly enjoy both of these things, but they seem a little silly together. 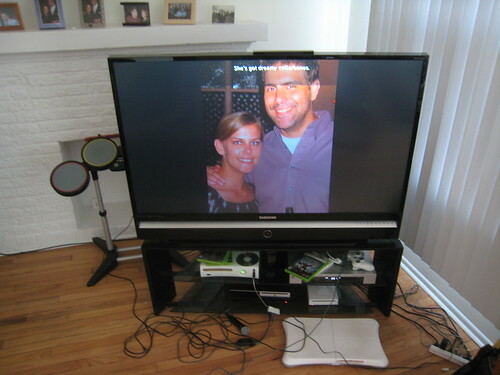 Still, we checked it out and ended up spending a long time looking at each other's Facebook photos on the big TV screen. The pictures are arranged from newest to oldest so we watched ourselves slowly get younger and thinner. After about two days in the hospital, Sarah's aunt gave birth to a healthy little baby girl. I had a little trouble getting into the hospital myself to visit. Me: Excuse me, where's the women's hospital. 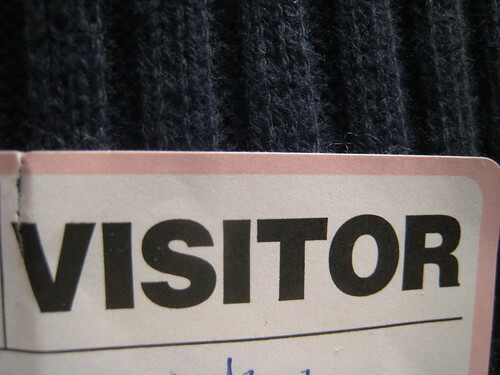 Hotel Concierge: Who are you here to see? Hotel Concierge: I need the name she checked in under. After a few text messages I got the correct last name. Hotel Concierge: And first name? Hotel Concierge: You're really not doing so well. Me: Everyone calls her Peggy. Hotel Concierge: Maybe that's a nickname. She probably checked in under her real name. Hotel Concierge: Who are you to these people? Me: That's a good question. I'm the boyfriend of a, uh... family member. I'm... I'm just trying to be a good boyfriend here. Hotel Concierge: [warming a little] We have a Margret. Me: Peggy could be short for Margret. Hotel Concierge: Boyfriends need to know these things. You need to know the family names. Me: I know. You're right. After a hectic trip it's nice to be back in my own bed... Oh wait. Sarah's aunt is giving birth, and the whole thing is going on much longer than expected. To help out I headed out to the suburbs to watch another family member's children. Basically that meant hanging out in the strange house all night while the children slept. It was just me and Tetley, the completely blind dog. The dog has been blind and living in that house for years, but still walks head first into walls every few minutes. That seems to be her way of getting around. Walk into wall, drag face and ear along wall until you get into the next room. Late into the night, I let her out into the backyard to go to the bathroom. There were only three steps, but she fell sideways off of them. I finally fell asleep on the couch. I woke up to the sound of the children on the phone pleading with their mother to come home, and no they did not want to wake up the strange man on the couch. These road gigs tend to be a bit of a blur. Airport, Van, Hotel, Sound Check, Show, Maybe Some Drinks, Hotel, Van, Airport, Home. Sadly, there's rarely much time to go see or do anything touristy. We were blocks away from the ocean. Never saw it. We were a town away from the Burt Reynolds and Friends Museum. No time to go. The show went well, though, and we had a big crowd. Maybe it was because of the giant roadside billboard promoting our appearance. Pretty impressive. Sadly, I didn't get a picture of that billboard. 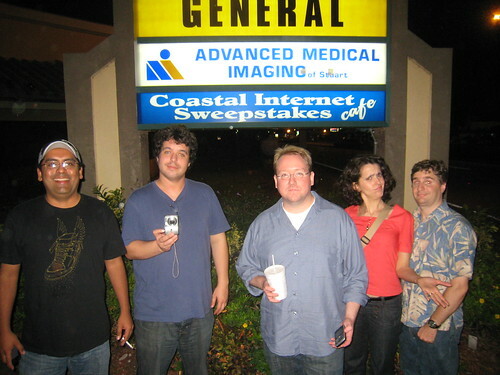 But I did take a picture of this 'Coastal Internet Sweepstakes cafe' sign that we all found really funny on our walk from the bar back to our hotel. Waiting for the sound check for a Whirled News show. 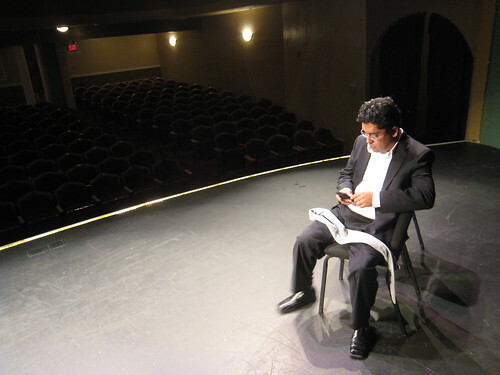 Eddie takes a moment to check Facebook, check his texts and find out how his daughter's first day of preschool went. 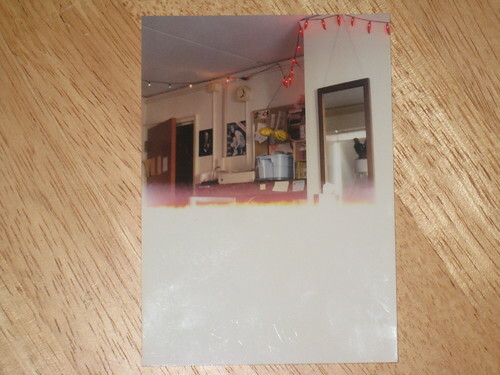 Digging through some old photos, I found this one of Tom and I's freshman year dorm room. It's only half a picture, half of it somehow exposed to light, I guess. Even just this bit you can see, though, gives you a good sense of it. Pretty typical. Magazine covers taped to wall? Check. Strings of Christmas and chili pepper lights? Check. I skipped my regular Whirled News show to watch the last show of Sarah's improv group, Cowlick. They'd been performing together at the Playground for six years. But half of them have moved away and the other half are busy with families and generally getting older, so they decided to retire the group with a big final show. During the heartfelt speeches portion of the show, Mary Beth said, "I moved to Chicago with a plan. I'd be here for two years. That would be enough time to get cast on the Second City Mainstage and then move on a deal with Saturday Night Live or something like that." Knowing laughter from audience. "None of that stuff happened, but being a part of Cowlick, and knowing how much we loved each other and how much we enjoyed playing with each other... it felt like had. And now it's over, and it's six years later and I realize that these guys tricked me, and I'm very angry at all of them." Later there were drinks and sad goodbyes (even though they've already planned a group cabin trip for early next year). I went with Young and Trupe to see Nick's high school production of 'The Diary of Anne Frank.' It was one of the stronger production I'd seen Nick direct. Oddly, Young and I had small cameo's in the play, our voices at least. Nick had asked us to record some of the radio snippets that appear briefly in the production. Young was British and Dutch. I was German. My lines were, "All Jews must be out of the German-occupied countries before July first. The province of Utrecht will be cleansed of Jews between April first and May first, and the provinces of North and South Holland immediately thereafter. Immediately thereafter." I recorded a couple takes on my computer and sent it to Nick in an email apologizing that it wasn't very good, but maybe he could find a take that would work. I'm not great with accents. That double, "immediately thereafter" at the end was especially tough. Afterward we hung out in the lobby with Nick's wife, Katie, so she wouldn't have to wait by herself. 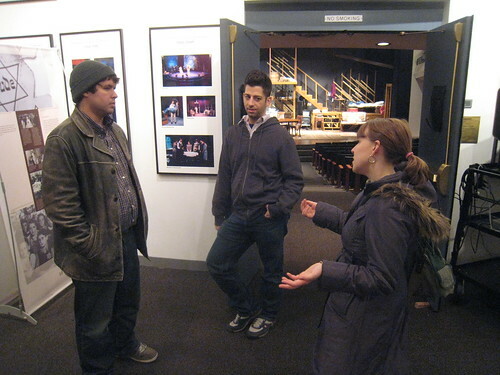 Katie: After the shows I just have to stand around for a while and be the director's wife, you know. A few of the cast members walked by, on their way to the wrap party. Cast Member: Hey, was one of the you the Dutch voice? Cast Member: And the German too? Young: That one wasn't me. Katie: This guy was the German voice. Cast Member: Thanks for doing it. They were great. Me: Trust me... you were all much better. We exchanged anniversary gifts after Sarah got home from her evening class. Sarah bought me a sweater and some underwear. 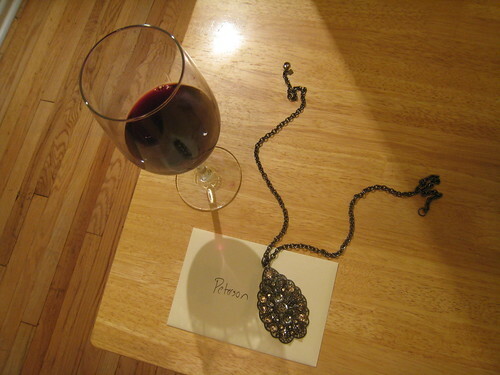 I bought her a necklace and a card. Sarah: A card! I didn't get you a card! What's going on? I'm turning into you. Me: What? I DID get you a card. Since Sarah has class tomorrow night we decided to go out for our special anniversary dinner tonight. 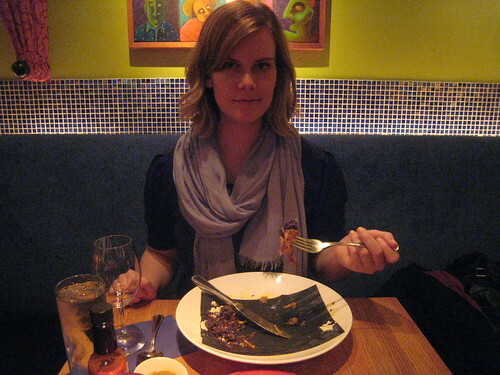 We went to the Frontera Grill, the restaurant of the 'Top Chef: Masters' winner, Rick Bayless. Me: Happy anniversary. Even though it's tomorrow. Sarah: Even though it's tomorrow. Me: And really it kind of should be Friday. Sarah: What? No. We had our first kiss on the 12th. Me: But it was after midnight. Sarah: So you're saying our anniversary has been on the wrong day all these years? Sarah: Do you want to change it? Me: No. I just want to talk about it every year. As I've mentioned a couple times, Tom and I lived together off and on through college. One year in the dorm. Two years off-campus. I asked him what I was like to live with. Tom: I primarily think of it in terms of details, rather than overall impressions. Like, there seemed to be a lot of water-drinking. I always think of the dorm fridge water pitcher and the late-night evil thirst from pizza. Me: Yeah. You really turned me on to water. Tom: That's a very lame claim to fame. Also, it seemed like there were always multiple half-empty water glasses we both left on various flat surfaces in our apartment until it looked like a scene from the end of Signs. There definitely seemed to be constant music playing. If the TV wasn't on, which, really, I don't think it was that often during the day--there was constantly very good music playing. Even if it was good music I didn't like. Tom: Part of what's difficult is that when I think of the apartment years, I mainly feel self-loathing because I think I was kind of self-obsessed and grating for the most part. Me: I don't remember you being grating, but we did kind of become slightly less friendly as the living together went on. Naturally getting on each other's nerves. I always kind of figured it was more my fault than yours. Tom: We should probably just blame [college friend we are no longer in touch with]. Tom: During the apartment years, you seemed to always be in some stage of relationship drama... though none of it was ever that dramatic. It was like very measured, calm drama. It's hard to think of anyone who wasn't having relationship issues during college, though. When I was going to take Tom's picture, he had another suggestion. Tom: Too bad you don't have the sombrero chicken. That's the image I'd use. Me: I still have that thing at home. Tom: Well. There you go. It's better than another picture of me staring dejectedly into the camera. And here's the chicken now. 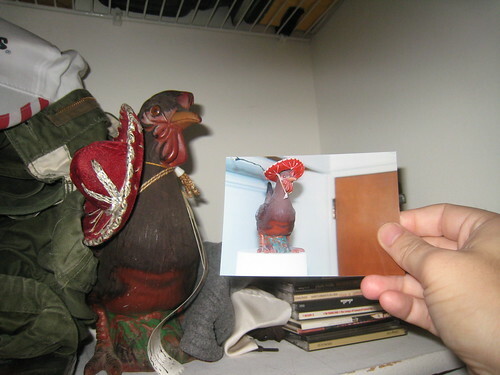 For comparison purposes, I am holding up a picture of the chicken from our freshman year dorm room. Lazing around the apartment, Sarah usually wears black pajama pants and a black hoodie. I make fun of her, saying she looks like a ninja. Sarah: [pointing at my brown pajama pants and brown sweater] Well you look like a turd. Me: Ah, the tale of the ninja and the turd. Meanwhile I'm taking the healthy eating down a notch. 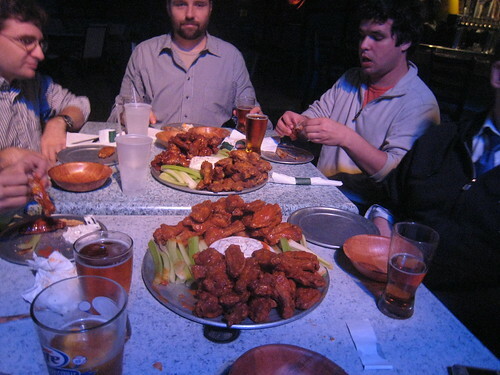 Last night Whirled News went out to eat 100 wings after our show. The big news of the evening was that Shane was back after having his appendix removed. Marla: How are you feeling? Marla: Do you have a phantom appendix? 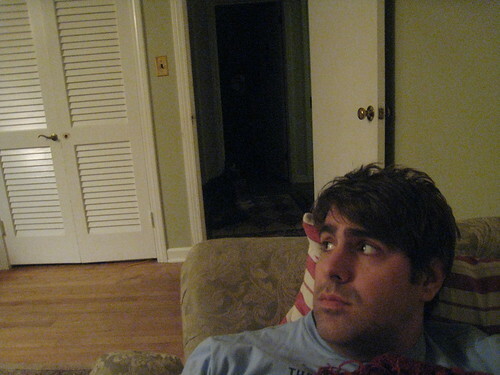 Shane: Ha. Yes. I wake up with the eerie sensation that a part of my intestine is processing bacteria. Sarah's taking the healthy eating up another notch. Sarah: I decided I love the Farmer's Market! I talked to real farmers! 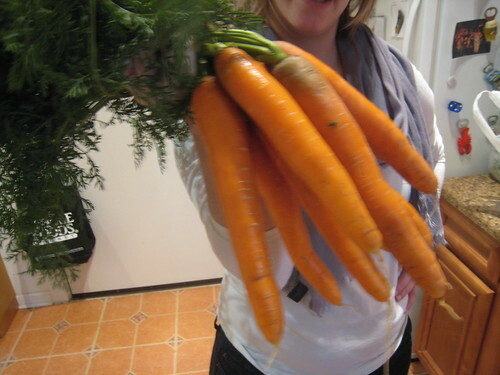 Look at these carrots. 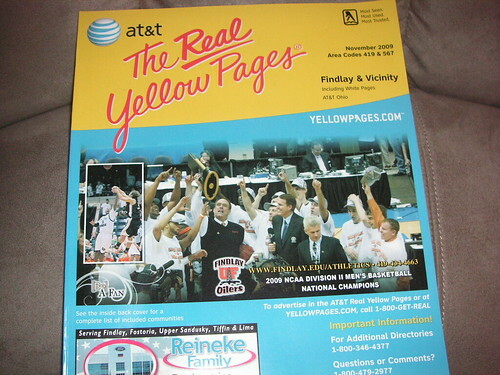 Mom sent me this picture of the new phone books out there. I love this. Our anniversary is coming up next week. 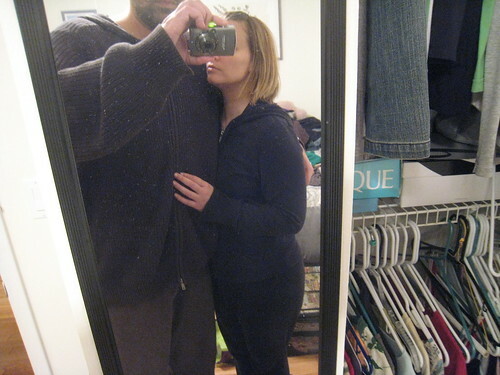 I've been blogging about my life off an on for the past five years (give or take), so out of curiosity I looked back at the blog entry from the day our relationship started. 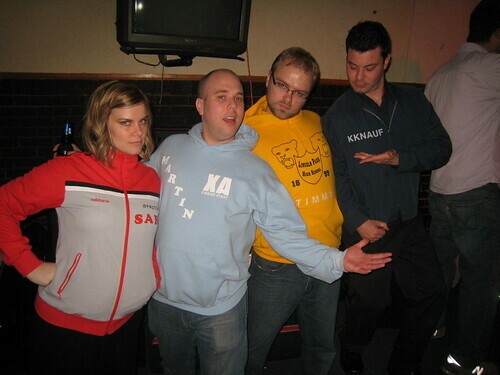 So, next I delved into my old picture files. What pictures did I take on that day? Apparently none. 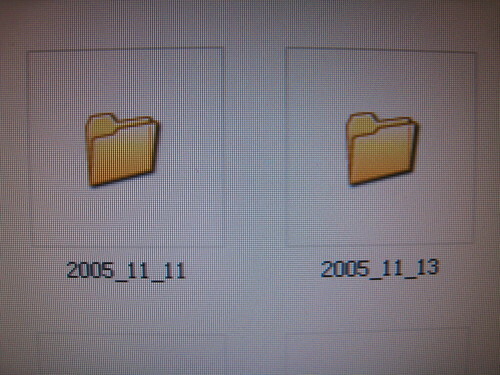 There's a folder for the 11th, and one for the 13th. But none for the 12th. My camera got no use that day. I must have been too busy falling in looooove. Oh man, a table in the front hallway of your apartment is the best. The best. A place to set down bags and keys and assorted things from your day. 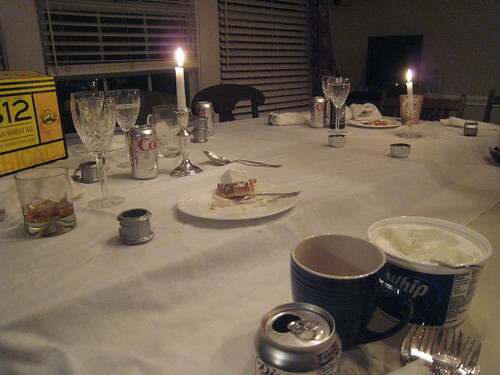 It's the table equivalent of taking your shoes off. 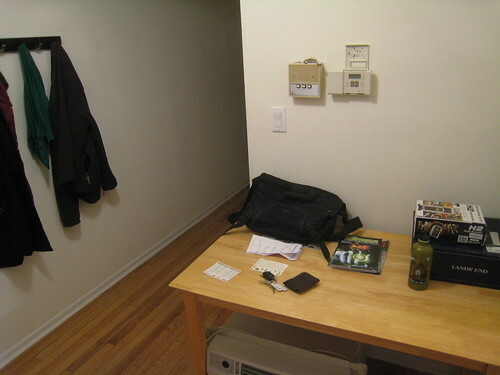 Now, it is clutter, worse yet, clutter right there when you walk into an apartment... but day to day, when no one's coming over, it's real nice. 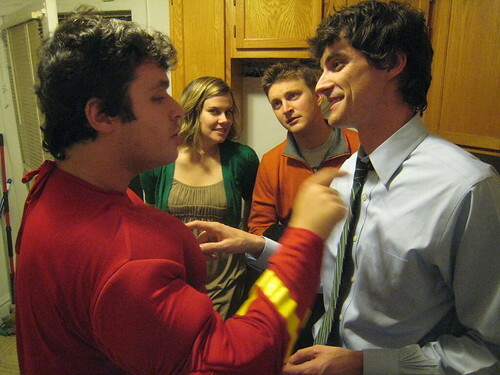 A slightly drunk superhero giving out unsolicited life advice. Otisgiving. A yearly gathering of members of my old, long-retired improv team, Otis. A good chance to catch up on what everyone is doing. Marc talked about his recent engagement. In this picture he’s talking about how he made the ring himself (while Duffy and Sarah are apparently in mid-swoon). He took a metalsmithing class and made a ring out of silver and moonstone. Marc: So, yeah, I made the engagement ring, and I’ll buy the wedding ring. [laughs] Because one of them has to look good, right? Marc had also grown a thick beard. It was originally part of a plan involving First Look photos for their wedding. His fiancée wanted to get First Look photos, which are pictures taken before the ceremony, of the bride and groom seeing each other in their wedding attire. It’s easier to capture that moment of seeing each other for the first time, that first look, under controlled circumstances. Marc was against it but finally agreed under the condition that he could have whatever facial hair he wanted in the First Look pictures. Marc: I was going to have a crazy British poofy mustache, where the mustache goes all the way over and connects with the sideburns. So, she’d turn around and… SNAP, the pictures catch her reaction. Oh, and I was going to be in a wheelchair. 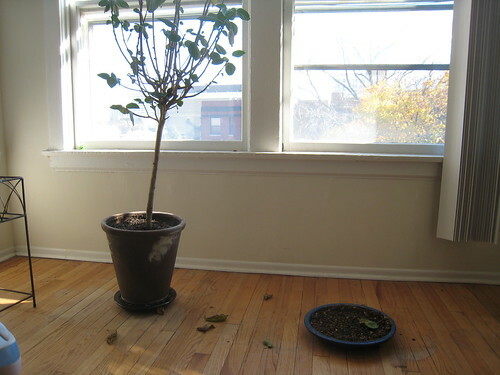 We had to throw out one of our plants, Battlecat. Sarah said the plant had spider mites and had to go before they spread to other plants. Sarah: It's kind of sad. Me: Yeah. I always thought of that plant as being you. Sarah: Me? Why was that one me? Me: Because I'm the tall one. Sarah: What about the other two. Me: They're off to the sides. They're just friends. Sarah: Well... eventually we can go buy a new me.